Bookworm3, my current youngest and resident sous chef, was also delighted with this book on sight. ("Eat! Book! Eat!") We looked through it together. Pie! Pie! Pie! It's all so satisfactory. Now the question is: where to start first? We have some out-of-town guests this weekend and I'm thinking a yummy chicken pot pie is exactly what is in order. (I also have a ton of potatoes on hand at the moment so we might have to check out that leek and potato tart.) It is always a good idea to make pies when there are plenty of people to share it with! It lessens the risk of having too much pie to eat all by one's self. 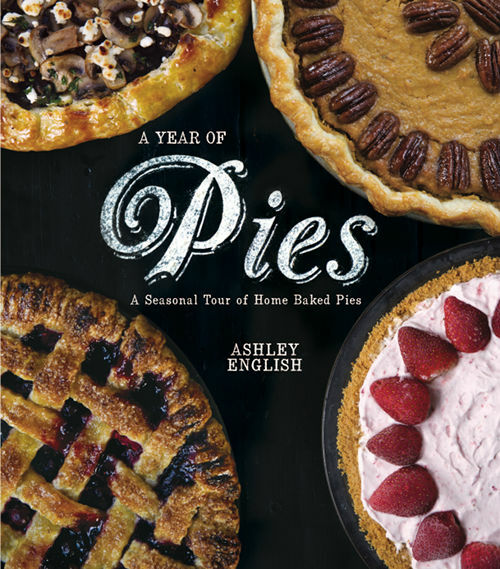 A Year of Pies : A Seasonal Tour of Home Baked Pies is a beautiful book. It is paperback and so the pages do not lay down flat. That's probably the one and only drawback that I see, given the fact that pies, especially, involve messy hands and lots of flour! But otherwise this is a nice little treasure book of pies and I'm happy to be adding it to my home collection. If you check back with me after the weekend, I'll let you know in the comment section how any number of these pies that we tried out this weekend came out. We shall see! Thanks to Sterling Publishing for sending a copy of this book my direction in exchange for my honest opinion. I make my own whenever I do pie (or quiche), but mine are more "tasty" than "pretty" at this point. My favorite sous chefs love to help out with these as well, although they are not quite at the point where they can do the crust without assistance. My extended family had one Thanksgiving when I would have been twelve or thirteen when everyone brought at least one pie. Think we had more than 1/2 pie per person - half of which were pumpkin. Since we were hosting, we got the leftovers, and ate pie for breakfast for several days thereafter. Good times! Confession: I have never made a pie crust (that I can recall,so if I have, it must've been less than memorable ;-) ). You've inspired me! This book looks fun! I'm not a big fan of pie but there are a few I like. Apple! Pumpkin! Vegetable quiche! Yummy! I asked my husband what dessert he wanted me to try making next weekend and he said apple pie. So I guess I will be making a pie as well. Still stuck with the store bought crusts for now (sorry!) because I have no idea how to make them homemade. I can't wait to hear how yours turn out! Pie is my favorite dessert. Ever. Ever. And homemade crust only! Most assuredly. I think I need this book.